The mooring space - known as the ‘Gaswork moorings’ - at Corbridge Crescent, near popular Broadway Market, is offside, has room for about 20 boats and has previously been used by boaters as casual 14 day moorings and the announcement by the Canal and River Trust that it has leased the site to London Waterways Projects has proved controversial. London Waterways Projects describe the planned development on their website as a “pioneer test site” for a “new approach to moorings provision on the basis of need and connection to the local area” and adds that eventually the site will have six berths, but that initially four berths will be available for five months from mid-March. “Through developing fixed price moorings we hope to enable individuals and families with most need, or who have a strong connection to the local area (perhaps through work or school) to put down roots without having to leave the water,” LWP states. Yet the plans have met fierce opposition from the National Bargee Traveller Association and other local boaters and a demonstration – described by the campaigners as a Sunday social – was organised for March 5th with around 30 boaters turning up and many more showing support on the busy London Boaters Facebook Page – although not all comments were supportive. Marcus Trower the National Bargee Travellers Association deputy chair, who was at the Sunday social, said that the planned mooring site development was tantamount to “gentrification” and that boaters where being forced out of the site and replaced by those who can pay. However, Lee Wilshire, head of LWP, disputes that the Gasworks site was ever “public” and says that mooring was available for only “a select few” and claims that the site had a history of vandalism and “criminal activity”. He adds that LWP has had its sights set on developing the Gasworks moorings since 2013. “The reason we are developing the site is because I approached the Trust back in 2013 following the GLA report with a list of plausible sites and Corbridge was the one which came out on top as the site deemed most suitable to try to develop,” said Lee Wilshire. “I don't think any of the people at the meeting thought we'd still be discussing this so far down the line, but that's working on the canal for you,” he added. The new mooring site and the campaign against it is proving divisive on boater forums and the conflict between the opposing sides is exacerbated by the fact that London’s ‘continuous cruisers’ do not all believe that permanent moorings are a solution to ‘congestion’ – or ‘popularity’ - in central London. However, many ‘continuous cruisers’ with children are finding the new enforcement policy – rolled out by the Canal and River Trust in early 2015 – hard to cope with and some would jump at a chance of a mooring as the only way to stay living on their boat. Alongside them are many currently ‘continuous cruiser’ boaters who would also jump at a chance of an affordable mooring near trendy Broadway Market. LB News understands that competition for the moorings at Corbridge Crescent is fierce. We also are aware that two of the moorings where offered by LWP to boaters before their availability was made public. Both offers were not taken up. The future cost of renting the moorings is one of the issues that the campaigners have raised. The initial short term moorings are available for around £400 pcm according to LWP, but campaigners say that those prices are bound to rise after the initial five month short term contract ends. LWP’s Lee Wilshire, who is also a London Boater and who runs the free boat-based rubbish collection on a stretch of the canal near Kensal Green, is on record saying that he needs to be able to recoup the development costs – which he estimates at around £200,000 – through the berth rents he collects during the period of the lease he has with the Canal and River Trust. This means that the length of LWP’s contracted lease with the Trust is “crucial” to the cost of the moorings after the initial five month period ends, says a source close to the campaign against the Gasworks moorings development, who says he was invited to a meeting with the developer. “I met with Lee Wilshire at his invite and he said he could only get a four year contract with CRT but had been hoping to get a ten year contract,” the campaigner said. “You do the sums - £200,000 divided by six berths divided by four years,” he added. “That comes to £8,300 per berth per year, or about £700 per month, and remember, the developer has said that two of the berths will be available for “community boats” and facilities so it’s almost certainly going to be a lot more than that,” he said. Nearby current CRT ‘fixed price’ moorings near Broadway Market go for £10-£12,000 per year. LB News asked Lee Wilshire if he had a lease with CRT and how long it was for. He told LB News that the lease was still being negotiated, but that the current offer was “more than 4 years”. He added that he was concerned for the tenants that were about to move on for the initial temporary 5 month period. “We have fundamentally tried to be fair to everyone and now have families with children ready to take on a mooring at the site but I am left feeling as though I may be putting young children in the line of fire,” said Lee Wilshire. 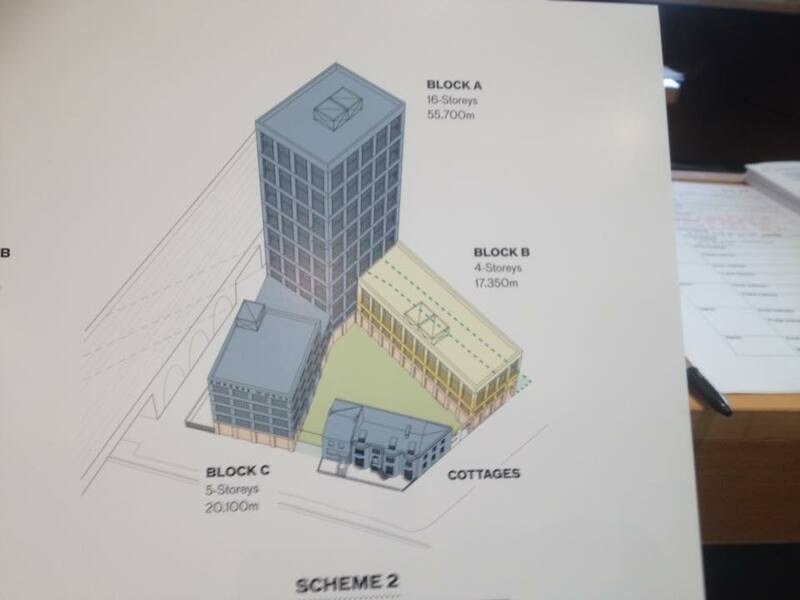 Adjacent to the moorings is a planned land based development that will include the demolition of the historic Victorian gasholder tower, which is likely to run for years, and has been opposed by the Friends of Regent’s Canal heritage campaign group. 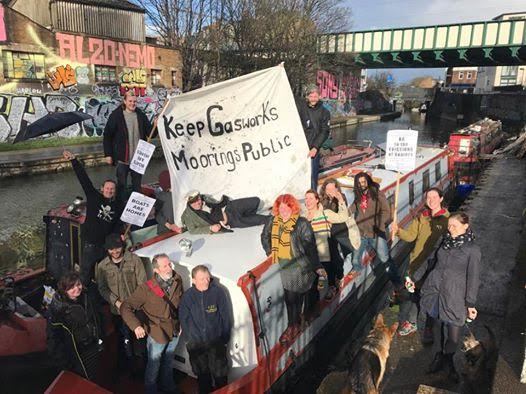 Graham Ryder, a local tradesman and boat dweller who was at the NBTA Sunday social, said that canal side industrial heritage and community space was fast being lost along the Regents Canal and he hoped the moorings could be saved for general use. “I have been lucky enough to be able use the gas works mooring in the building of my narrow boat, Gwendowlyn,” he said. “It has been the biggest and best project I have ever worked on and the gas works mooring is one of the few places that people can do work on their boats away from the towpath”. 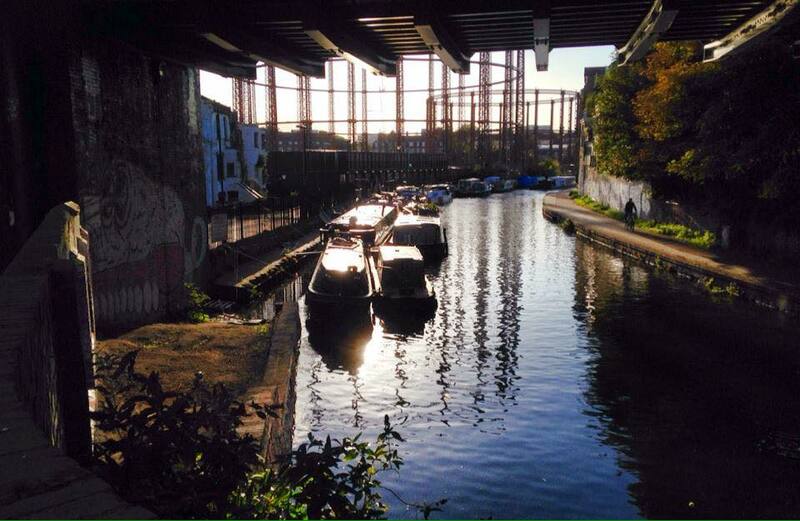 In November 2013, a London Assembly report investigated the increasing popularity of the London canals – particularly in central London and Hackney – and their first recommendation was that the Canal and River Trust should “increase temporary mooring supply and ensure as far as possible that towpaths have soft verges, mooring rings or bollards, are free of debris or silting up in the waterway and, where possible, are accessible to boaters with disabilities.” The report also recommended that “roving mooring permits” or “community moorings” should be trialled and that CRT should ensure that some permanent mooring sites should be at a fixed affordable price and not subject to the current CRT auction system. With the LWP stated application period for the initial five month moorings closing on the 25th February and individual rental contracts starting in “early to mid-March” and campaigners threatening to oppose any planning application and aiming to stay put on a 14 day rota - it appears that there may be yet be more trouble on the cut to come at the Gasworks moorings.